French Knitting Nancy Doll is a traditional craft toy which has been around for generations. 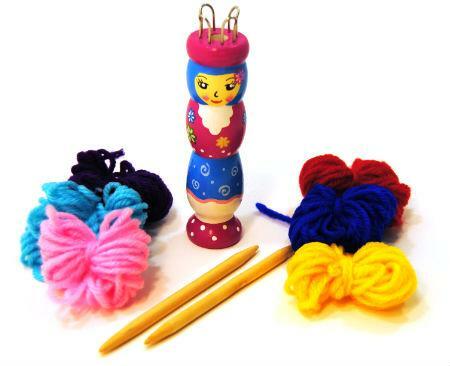 This type of craft toy was originally made with nails in the top of a wooden cotton reel and was called a Knitting Nancy or French Knitting Doll. This great set comes with full instructions, six little balls of wool, the knitting doll, and stick to push the wool through the centre and pick the loops at the head of the doll. A lovely craft toy which people have been enjoying for many years. Size: Doll stands 12cm high. We like this because: "Has instructions included very nice version of this toy."